Bannister Shield | BabySecure Inc. This clear plexi-like plastic cover for railings prevents children from falling through or getting stuck between the posts. It also helps to prevent access to footholds to climb or body parts getting scrapped by sharp edges of decorative metal railings. Builders may not respect builing codes which generally suggest the space between, centre to centre, should be 4" or 10 cm. For child safety, the recommendation is 6 cm (diametre of a pop can) which are the regulations for cribs. 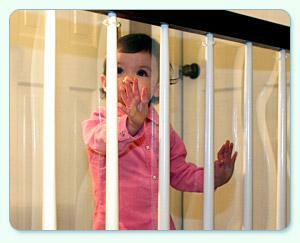 Baby Safety Gates and outdoor play structures work with 3 to 3.5 inch spaces. Bannister Guard also helps to prevent children from pitching toys through the slats and breaking chandeliers or beaning parents below. Made of a shatter proof plastic, it is pliable enough to turn corners. Holes are made in the plastic with a drill or with the hole punch (provided) and then attached to your railings with cable ties. An easy temporary safety measure, which can be removed when children are older. Once installed, no one notices its there. See Attachment below for more details about installation. 33" in height, it is sold by the linear foot.